Most swimmers are surprised to learn about the potentially corrosive effects pool water chemicals can have on teeth. When maintaining a pool it’s a constant battle keeping the temperature, chlorine level, and pH level balanced. When the pH level isn’t properly balanced (and sometimes even if it is) your smile can be exposed to excessive acidity levels. Swimmer’s calculus reveals itself as hard brown tartar deposits that show up primarily on front teeth. It’s difficult to remove by yourself, but it can be removed during a deep dental cleaning. Regardless of where acids come from—whether it’s from sports drinks, certain foods, soda pop, or pool water—acids can eat away at tooth enamel. Thin enamel can lead to accelerated decay and uncomfortable sensitivity. Drink water! NOT pool water… Drinking water! For example if you’re swimming laps, set a bottle of drinking water poolside that’s easily reachable from inside the pool. Take a drink often and swish your mouth with fresh water. Also, be sure to drink and swish a lot right after your workout. 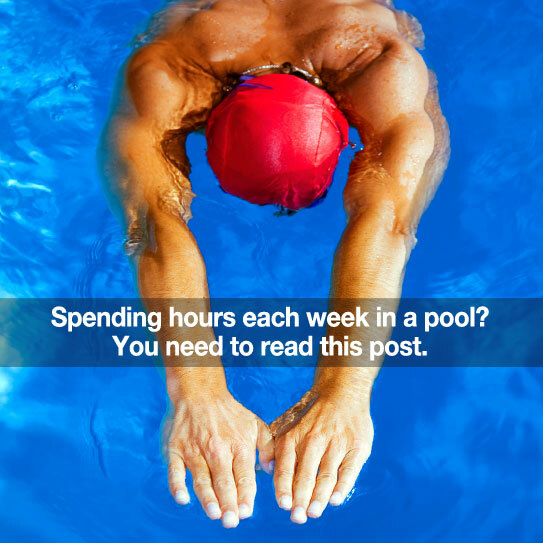 If you’re only in pool a couple hours a week, or at the hotel on vacation, chances are you don’t need to worry about this. However, pass this information along to others! Most people have a friend, extended family member, coworker, or mail carrier who spends a lot of time in a pool. Call us if you any questions about this topic, or leave a comment below. We look forward to seeing you during your next visit!